This week Kelly brings us an explosion of color with her new collection, Color My World. 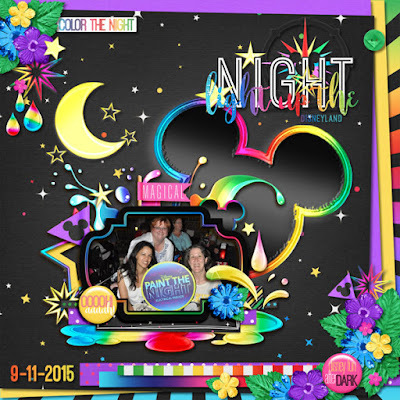 It is specifically designed for the World of Color shows at Disneyland, but has so many other wonderful uses for night time magic at the Walt Disney Parks. Neon colors will make your layouts pop. Don’t forget to add the Page Starters, Journal Cards, Word Art, Word Flair and Quick Pages to your stash! The kit includes 15 bright solids and patterned papers and a full black and white alpha. There are over 60 unique elements including buttons, frames, heart, Mickey fun wheel, Mickey head, moon and stars, pennants, splashes of color, stars, word titles and much more! Now how about some adorable freebies to coordinate with this new kit? You can find them here and at Julie’s Blog. Have a great weekend and happy scrapping! Thank you for the awesome paper stack!